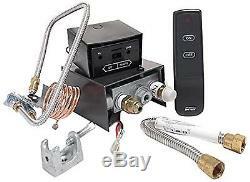 Skytech AF-LMF/R Remote Controlled Fireplace Gas Valve Control Kit. The Skytech AF-LMF/R gas valve kit was developed to provide safe, reliable, user-friendly control for gas heating appliances. This safety pilot kit was designed to be used with 18 to 30-inch gas logs sets. The AF-LMF/R features manual On/Off gas valve with solenoid and a remote control with On/Off function. It includes a complete pilot assembly with 30-millivolt thermocouple, On/Off remote control, damper clamp, and all connectors for the main burner and pilot. The kit is for use with natural gas (NG) vented logs. Product Dimensions: 6 x 8 x 6 inches. The item "Skytech AF-LMF/R Remote Controlled Fireplace Gas Valve Control Kit" is in sale since Thursday, February 16, 2017. This item is in the category "Home & Garden\Home Improvement\Heating, Cooling & Air\Fireplaces & Stoves\Replacement Parts". The seller is "melondelight" and is located in US. This item can be shipped to United States.